We had a bit of a scare this week when Tofu ran inside on his own and sat under my desk hunched up, trembling and grinding his teeth. Teeth grinding in rabbits can indicate pain and he refused food and water including bunny favourites like carrots and pellets. When he gets his cheeks and arms rubbed, Tofu stretches out his arms to say “OOoooOooh yeah, dat’s good”. So he got plenty of that and it was a relief that he was responding to touch. He was hunched up like this for over an hour. We kept him warm by covering him a folded towel, patted him and tried to entice him with food. Rabbits graze all day so it’s a concern if they refuse food for any period of time. It’s often bad news. Suddenly, he was fine again. 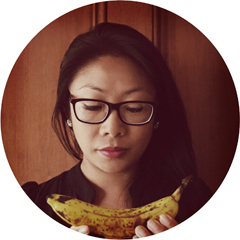 All the untouched food we had laid before him, was demolished ate with great fervor. He devoured everything. The last time he was sick (last summer), we suspected it was heatstroke. But Auckland is only about 14°C during spring so that couldn’t have been it this time. Our neighbour had just mentioned that the weeds in our backyard were toxic so we quickly did some investigating to figure out what type of plant it might be. 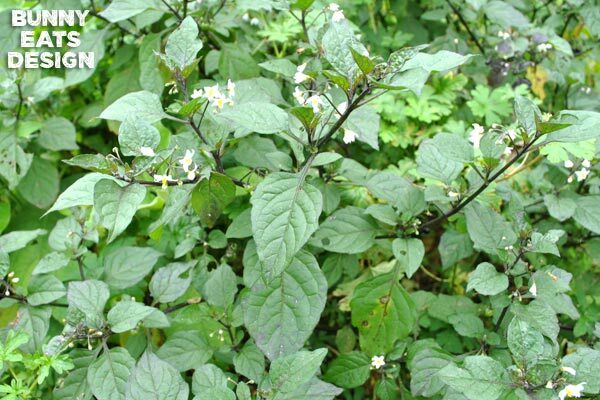 These plants are black nightshade and while not as toxic as deadly nightshade, they are still bad news. Potato and tomato plants are related and are also toxic. 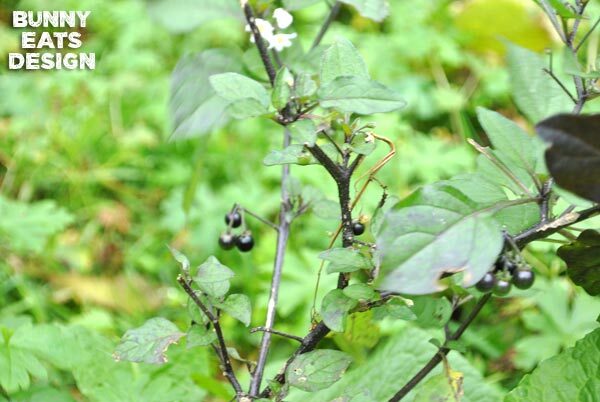 Black nightshade is common in New Zealand and is spread by birds who eat (and poop) the ripe black berries. Not much you can do to protect your garden apart from banning birds. Black nightshade is found in young or disturbed pastures which makes a lot of sense as our garden was heavily weeded months ago. Lots of plants were torn out and patches of dirt were ready and waiting for something else to take over. We can’t be sure it was the weed that made Tofu sick, but we didn’t like the idea that it could happen again. Black nightshade can attack the nervous system so trembling and loss of appetite can be indications of black nightshade poisoning. We can’t use chemicals in our backyard with Tofu running free, so we pulled and cut out all the black nightshade. There was a lot of it. There are still dropped berries, but there isn’t a lot we can do about them at this stage…Can you vacuum the backyard? 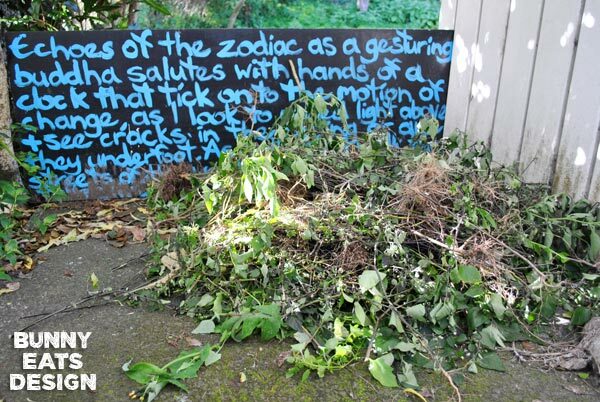 Our pile of black nightshade. It seems that the ripe black berries are eaten both raw and cooked (sprinkled on muesli or made into jam) and the green leaves are eaten when cooked (by Vietnamese). But I’m happy to get rid of all instances of black nightshade from our garden without exploring it’s culinary uses. Foraging is only good if it’s a sure thing. And then we have this mystery plant that is growing all through our backyard. Does anyone know what this is? A lone mystery plant by the shed. It looks like a bug has given one of the bottom leaves a good munch. Does that mean it’s fairly safe? A whole tribe of mystery plants. 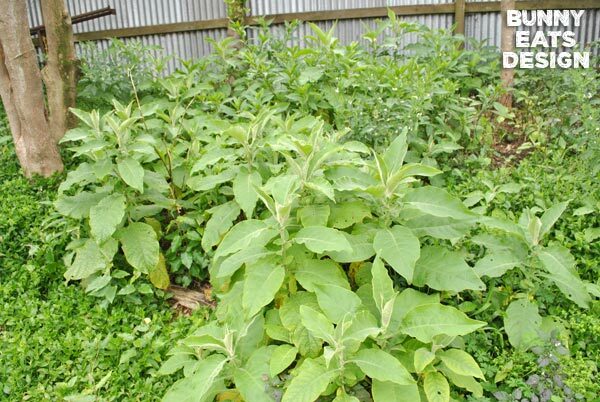 We haven’t seen Tofu eat any of these plants or the black nightshade, but should we pull up the mystery plant just in case it’s a poisonous plant? Ooo, I don’t know the mystery plant, but take a cutting to a garden centre and they should be able to help you. As for the first plant, I’ve always wondered because it really looks like a herb…but there is something just not quite right about it. I’m glad to know NOT to try and use it as a herb! Not that I’m in the habit of picking random things for my plate, but you know. Glad the bunnah is betta! Hi Marie, well your instincts are right. Some people do eat it but others claim it to be toxic. I’m guessing that there are several forms of this plant that look very similar, or that they must ripe and cooked to be safe. Hi Craig, we did get a huge tree out of one. It has been removed now but we have many seeds all over so new ones keep sprouting. I imagine they will keep doing so for many years to come. 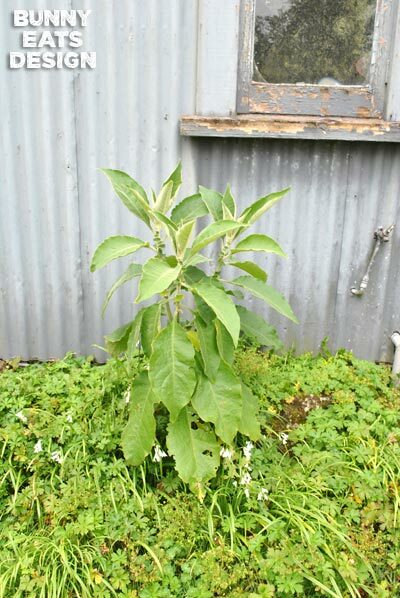 The big plant is Pokeweed – should have grape-like bundles later in the season with purple grape like berries. 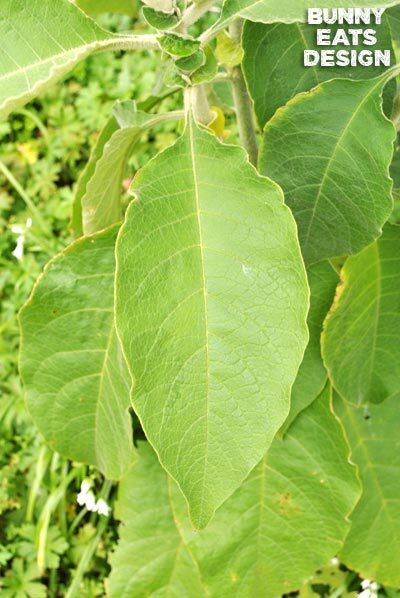 Pokeweed is poisonous. Thanks for your comment, but this is not pokeweed as the berries and flowers are quite different. The first plant is black nightshade and the second is woolly nightshade.